This is the first artprint of the "1939/1945 by PERINOTTO" collection, published by Golden Creek Studio. 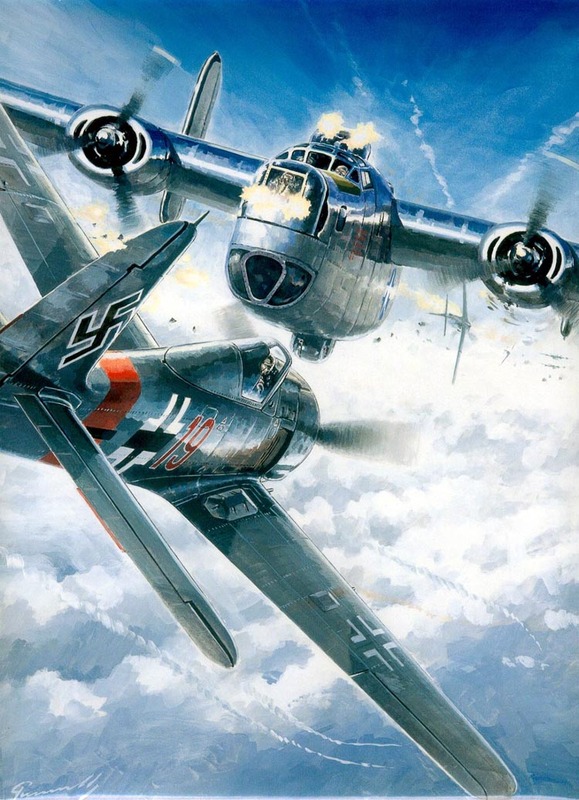 It shows a B-24 Liberator under attack by a Focke-Wulf Fw190. From 1943 until the end of World War II, the US Air Force launched massive waves of bombing, targeted to the occupied zones in Europe; because those operations were taking place during the day, the Luftwaffe was using the Fw190, a fighter renowned for its capabilities in daylight conditions. Perinotto produced the original gouache for a frontcover of the "Fana de l’Aviation", the most popular magazine for french-speaking aviation enthusiasts. Such a masterpiece deserved a high-quality print and a large print size, actually the same size as the original gouache (20'x26'). or contact Golden Creek Studio for more details.